We are thrilled to announce that our multi-million dollar renovation is underway. Some noise may be noticed from 9AM to 6PM daily while work is being done. We appreciate your patience and we look forward to showing you our beautiful transformation. This hotel is 100PCT Non-smoking. 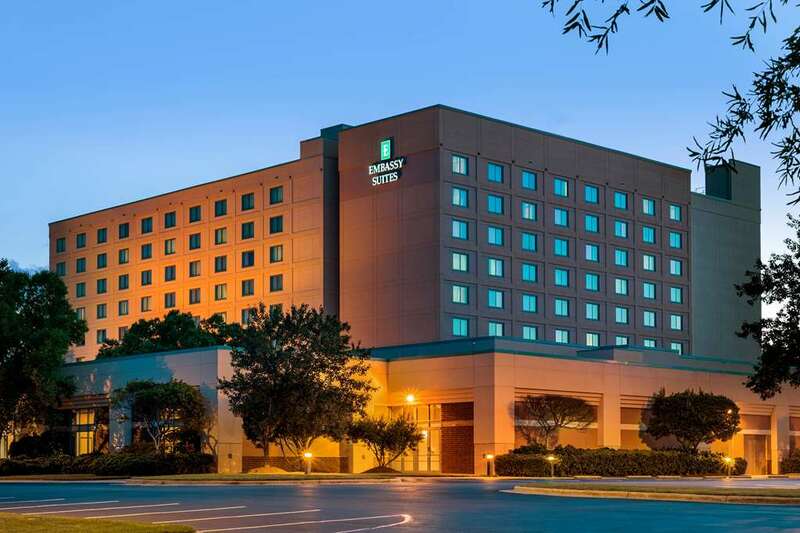 The Embassy Suites Raleigh-Durham/Research Triangle hotel is located in Cary North Carolina just minutes from Research Triangle Park /RTP/ the RBC Center and Raleigh-Durham International Airport. This upscale full-service and all-suite hotel is just minutes from the campus of North Carolina State University /NCSU/ North Carolina State Fairgrounds Crabtree Valley Shopping Mall Cary Towne Center and South Pointe Shopping Malls Carter Finley Stadium Raleigh Convention Center BTI Center Reynolds Coliseum and the North Carolina Museum of Art. The University of North Carolina at Chapel Hill /UNC/ Dean Smith Center Wallace Wade Stadium Duke University Cameron Indoor Stadium and Kenan Memorial Stadium are all just a short drive away from our Embassy Suites hotel. Guests of the Embassy Suites Raleigh-Durham/Research Triangle hotel stay in spacious two-room suites and receive a complimentary cooked-to-order breakfast a nightly manager*s reception and high-speed internet access. Room Service: Room service is available 1100am - 1100pm daily. Crystal Falls Lounge: A classy casual unique atrium setting offers a lighter fare and cocktails. The Angus Barn: Local specialty steakhouse featuring one of the country*s best wine list.